COFINOX, the leader company in the sheet metal industry, expands its machinery with a blasting equipment consisting mainly of a cabin, an auxiliary loading table and an abrasive spray gun. Abrasive blasting is a superficial cleaning technique done by impact that removes any rust, mill scale, paint and foreign material in a metal part. 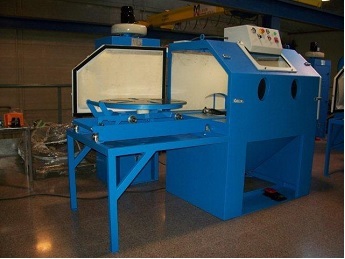 With the start-up of this new equipment COFINOX wishes to reinforce its range of finishes, especially sandblasting.